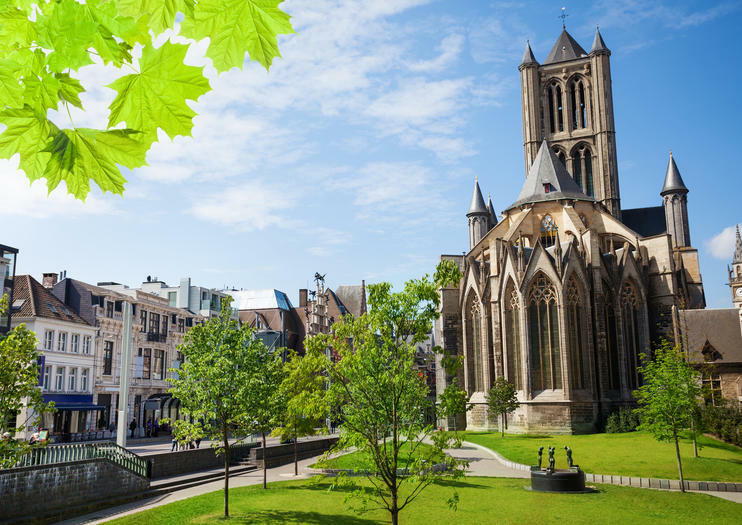 Owner of the oldest of the three great spires that dominate the pedestrianized heart of Ghent, St Nicholas’ Church was constructed between the 13th and 15th centuries in an eye-catching mixture of Romanesque and Flemish Gothic architectural styles. Built of Tournai limestone, its lovely exterior is adorned with flying buttresses and spiky spires as well as an imposing central tower; all this grandeur was paid for by Ghent’s wealthy medieval merchants to signal their wealth to the rival Flanders trading cities of Bruges and Antwerp. It’s probably more beautiful inside than out, but nevertheless all eyes lead to the Baroque high altar with its twisted side columns, floodlit through stained-glass windows high above. The church is currently under restoration but faint traces of fresco can still be seen on the supporting pillars of the nave. For the best view of St Nicholas’s flying buttresses, head for the viewing platform of the Belfry a few steps away. Korenmarkt. Free admission. Open Mon 2–5pm, Tue–Sun 10am–5pm. Make the most of your time in Belgium on a day tour of Ghent with stress-free round-trip transport from Brussels. Going with a guide ensures you never get lost, as well as learn little-known facts and anecdotes about the area’s highlights, from the Belfry Tower to the harborfront. Free time to explore Ghent and Bruges is included for your convenience. Don’t let limited time in Bruges stop you exploring further afield. Tick off two other Belgian cities in just one day on a day trip that takes you to Ghent and Brussels and proves the ideal choice for time-pressed travelers. A guide takes care of arranging transport and sightseeing so you don’t have to, and ensures that you’re party to insider knowledge that you’re unlikely to find in the guidebook. Take advantage of Belgium’s small size and tick off two major cities in just one day on a tour of Ghent and Bruges. Departing from Bruges, you’ll travel to Ghent—hailed as Belgium’s best-kept secret—and explore the historic centre before traveling to Minnewater (Lake of Love), located on the outskirts of Bruges. Letting someone else drive allows you to spend less time navigating and more time enjoying the scenery, while exploring with a guide gives you the inside scoop on culture and history.